I always enjoy the drummer in a band. 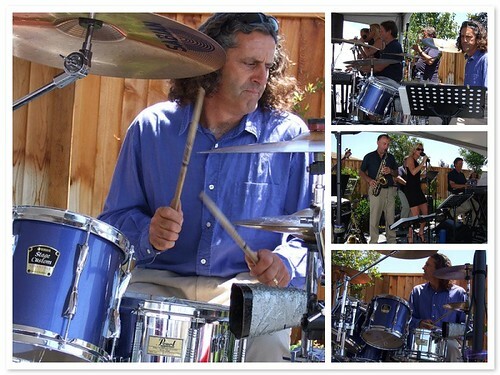 I shot almost 30+ pictures on this band while visiting San Ramon Windemere open house. It is a great band with lovely music and the drummer is the person that gets my most attention. Not only does he play wonderful music, he plays with his heart and soul into the music. And his shirt color matches his drum. And I wish I know how to play drum like him. He is so cool looking and he certainly enjoys what he does and I can sense it from the smile and movement of his body in perfect tune with the music. I am glad that I have my Fuji F30 to take all the pictures in the event in a non intrusive fashion. Drummer. Genius. Why didn't I think of that!!! G has a complete drum setup in the garage, self taught he is getting pretty good! remember me of xmas already. little drummer boy! Nice capture of the color coordinated drummer. It is never too late to try and learn the drums.